AOL Radio Blog just announced its list of the 100 Worst Songs Ever Made. I think they got a number of them right, including Feelings by Morris Albert, Disco Duck by Rick Dees, You Light Up My Life by Debbie Gibson, and, of course, Seasons In The Sun by Terry Jacks, which should have been number one. 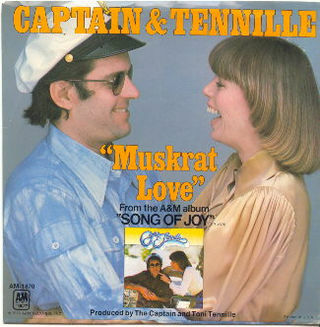 Some of my picks, which they left out, would include Muskrat Love by Captain and Tennille (photo below), Happiest Girl In The Whole USA by Donna Fargo, The Night Chicago Died by Paper Lace, and Billy Don’t Be a Hero by Bo Donaldson and the Heywoods. What songs made you want to gag and should be on the list? Please comment below. I think that the person who sings “Ridin Solo” has one of the most annoying voices i’ve ever heard! How about “Echoes of November” by Rich Allen and the Ebonistics? Or for that matter any hip/hop or rap song with repetitive, violent or misogynistic lyrics. If you want to hear the worst music in history search for “The Notekillers”. I hate to say that because they are high school buddies, but their music…ouch!!!!!!! I think I’d rather have a pit bull attached to my leg while swimming upstream through a lava flow.